The inter-webs have been abuzz about the revelation of Apple's new ipad, and as always, I'm late to the blogging party. Now I'm no Apple fanboy, and I'm not particularly impressed by Apple's new slate. Personally I wouldn't buy it, but I'm sure there are tons of people out there that would love to own one. The one thing however, that has really been bugging me lately, is how so many people are proclaiming the ipad to be the Kindle killer, and that Amazon (and all other e-book reader makers) should just close up shop. Yes, the ipad is capable of providing so many more services then the Kindle, such as full web browsing, office programs, and movie playing capabilities, things that the Kindle cannot possibly offer. But Apple fans are forgetting that the reason that people buy Kindles and other e-book readers, is so that they can read books, and not browse the web. E-ink, the display technology behind most e-book readers, is an amazing technology, and not just because of its superior battery life, but because reading it is like reading a newspaper. Anyone who has read plain text on a computer screen for hours at a time, knows that it is not a particularly fun experience. Back-lit screens are stressful on the eyes after long periods of time, whereas reading a good-old-fashioned paper book is a much easier experience. I own several e-books and I actually read Stephanie Meyer's God-awful Twilight book on my computer screen and it was not an experience that I want to repeat, not just because of the terribleness of the book but also because of how my eyes were starting to burn from staring at a back-lit screen for so long. Now I have a friend that says he likes to read books on his iphone for extended periods of time, and I'm fairly certain that hes either a freak of nature, or a bold faced liar. But aside from the scarce masochistic few who enjoy burning their retinas out staring at glowing boxes, most everybody else would rather read paper books. E-ink has allowed for electronic reading devices that are easy and comfortable to read on. This is something that the multi-use ipad does not offer, and it is the reason that dedicated e-book readers like Amazon's Kindle aren't going anywhere just yet. I don't mean to imply that the ipad is doomed to failure, but rather that the ipad is a device meant to do many things and cannot compete with dedicated e-book readers like the Kindle. For the past three months, while on my way to class, I've been walking past a wheel-less bike chained to a bike rack underneath an overhang. The bike's distinctive bright green saddle was pretty much the only speck of color amidst a sea of dirty Huffys, so it was hard to miss. One day, I happened to catch a closer glimpse of the green-saddled bike and was surprised to notice that it was a Miyata (I have a soft spot for Miyatas, since I already own one), and closer inspection revealed it to be a Miyata 914. I spent several minutes examining the Miyata and noticed that aside from the thick layer of dust and grime that coated it and the lack of wheels, it was in surprisingly good condition. I started to wonder if the owner of the Miyata had graduated and forgotten his bike, or had simply abandoned it after the wheels were stolen. On the off chance that the latter was true, and hoping that the Miyata's owner still walked the same route to class, I left a note asking the owner to contact me if he had any wish of selling. My note was gone the next day, and I received an e-mail from the Miyata's owner by the end of the week, saying that he was considering selling his bike and would I make an offer? Betting that any man who puts a kick-stand on a semi-pro bike (the atrocity!) and leaves it outside for three months, probably doesn't realize the worth of a good, splined, triple-butted Miyata CrMo steel frame, I offered him a low-ball offer of $50; high enough to tempt him into selling, but still low enough to make it a bargain buy. We eventually settled on $75, which was higher then I would have liked, but still pretty decent. 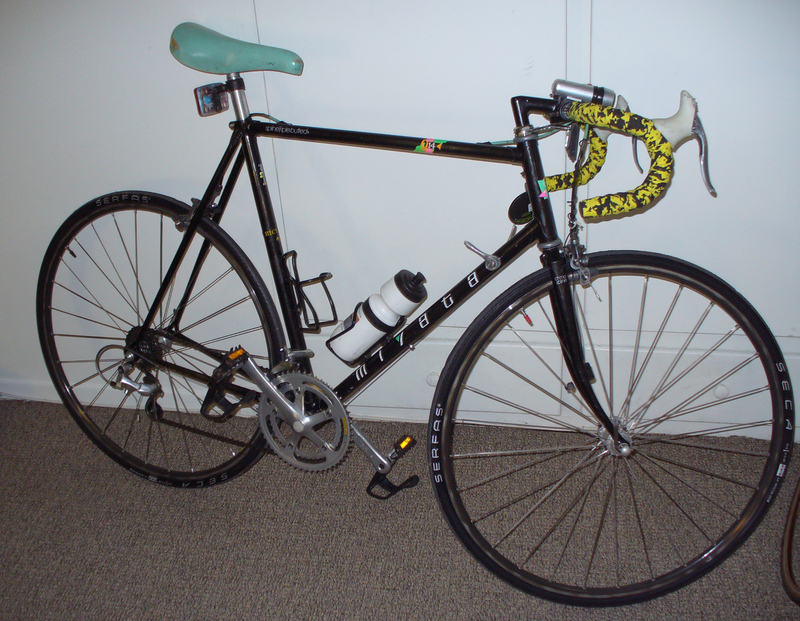 I've been told that the Miyata 914 has the same frame as the top-of-the-line Miyata Team, but with slightly inferior components, and I saw a NOS 1990 Miyata Team selling for $600 on ebay, which makes the $65 I paid seem like daylight robbery. I think given the condition of the Miyata that I purchased, it could have fetched close to $200 on craigslist. My initial suspicions about the owner were confirmed when I met him: he did not appear to be a cyclist and didn't realize the full worth of the Miyata 914. Strangely enough, he was several inches shorter then me (I'd put him around 5 foot 7 inches), which would have meant that ridding the 60 cm Miyata must have been extremely awkward for him. As soon as money and bike exchanged hands, I raced home, threw some newspaper down and set up my bike stand in the middle of the living room (thank God my roommates weren't home...). I started with just cleaning the bike off first, and as soon as the dirt started to fall away, I began to realize that the 914 was actually in better condition then I had thought; the paint was only scratched in a few places, and the chainrings looked brand new. Last quarter was probably my worst quarter ever. So of course, I have resolutely set out to change my habits and turn my academic performance around. Of course, its only the second day of school now, but I think my first day of class was exciting enough to deserve some blogging. This quarter is momentous as it marks the first time in a year that I have enrolled in a non-engineering course. In this case, I'm currently enrolled in a statistics and a math class (among other classes). So the thing that astounded me upon first walking into my statistics classroom, was that there were girls in my class, more specifically, there were a lot of girls in the classroom (around 50%). This is in stark contrast to most of my engineering courses, where a classroom that is 20% female is considered to have an unusually high female to male ratio. I've had an electrical class with 14 guys and 0 girls, and a computer science class with 19 guys and 1 girl. Walking into my stats class, I felt as though I had entered another realm. My first day proceeded to get more and more interesting. I spent fifteen minutes sitting in what I thought was my computer architecture class, before I realized that I was in the wrong class. Checking my schedule, I realized that my computer architecture class is on Tuesdays and not Monday (on the plus side, I was in the right room). Too embarrassed to push my way through the five people obstructing my path to the aisle, and walk out during the middle of class, I sat through the rest of the lecture, growing more and more confused about automata theory (a subject I was totally unqualified to understand). But on the home front, I discovered that one of my roommates had left a pan of some sort of cooked food in the fridge over winter break, which meant that it was nearing almost four weeks old. So of course, the unidentifiable contents of the pan are now sporting a pretty coating of green and white mold. I stated how disgusting it looked and told my roommate that he should probably throw it out. Whereupon, he removed it from the fridge and placed it in the sink. The pan has since migrated to the countertop, and it appears that the green mold is now starting to outstrip the white mold (Go Green!). As of noon of today, the pan and its contents were still sitting on the countertop. Some part of me finds it extremely revolting, but another part of me is fascinated and wants to take pictures. I've decided to just not look at it until he throws it out.